This chapter illuminates two critical aspects underpinning university life in the Nordic countries, namely, who gets involved with strategic processes and to what extent these processes affect behaviour across the organisation. Participation in strategy work was found to be unstable, which in turn further weakens the legitimacy of the strategy. The comparative data also show that some academic staff are not involved in the strategy process at all, and hence do not relate their daily tasks to the goals and/or values expressed in the strategy. The importance of strategies appears to lie in recognising the relevant problems, values, and normative postures, including the excellence and relevance of universities. The findings have implications for policy, practice, and future research inquiries on the topic. Interest in organisational strategy spans more than half a century and is a central topic in the business management and organisational literature (Miles et al. 1978; Chandler 2003). Within the organisational field of higher education, particularly in Northern Europe, strategic planning has only emerged in the last two decades or so, as a result of governmental reforms inspired by ‘new public management’ (Mouwen 2000; Rip 2004; Salminen 2003), leading to the rise of strategic science regimes. Strategy could be broadly defined as pertaining to ‘a deliberate conscious set of guidelines that determines decisions into the future’ (Mintzberg 1978, 935). Mintzberg makes an important conceptual distinction between ‘intended’ (the aim and goals) and ‘realised’ (the means used and the results) strategy and refers to the strategy formulation process as ‘a pattern in a stream of decisions’ (Mintzberg 1978, 935). In other words, strategies are instruments of change, and within higher education institutions, the responsibility of academic leaders who carry them out is to maintain the operation, but at the same time, to embrace change opportunities. Strategies are also flexible tools for dealing with a range of requirements and threats and are related to how universities focus on funds allocation, financial stability, management structure, central operation units, and operational monitoring (Uslu 2018). It is important to ensure the wide support of key stakeholders because the implementation of strategies requires dialogue and compromise (Whittington 2006). Academic staff, in particular, might find that the strategies adopted clash with their own strategic interests and motivations and that they are of low relevance to their performance (Elena-Pérez et al. 2011). The highly dynamic and competitive environment in which universities and other higher education institutions operate places emphasis on the need to adopt strategic focus areas, increase the diversity of the funding base, identify and engage with a multiplicity of internal and external stakeholders, and prepare operational alternatives for performance management (Aarrevaara 2015). Given the traditionally high levels of structural (and cultural) decoupling within universities (Birnbaum 1988), academic subunits and individuals tend to resist attempts to set strategic management priorities at the level of the central administration (Pinheiro and Stensaker 2013). Recent developments suggest that, as a result of managerialism, centralisation is on the rise within universities/subunits (Deem et al. 2007), and that the strategic management of people, resources, and values is one such manifestation (Fumasoli et al. 2015). Who gets involved in strategic processes in Nordic universities? To what extent do strategies affect academic and managerial behaviour? To answer these questions, we have developed a conceptual framework that includes several theoretical perspectives on how to interpret strategy work within universities. The data for this chapter were drawn from interviews1 and a survey with academics, managers, and administrators based at public universities in Finland, Norway, and Sweden. 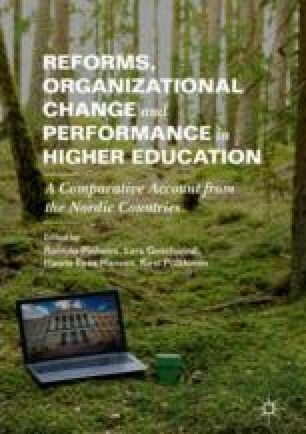 This was part of a much larger project focusing on the performance effects related to changes in leadership and managerial structures of Nordic universities in recent times (consult the introduction to this volume). Their views constitute their perceptions about the key starting points and identification of the strategy, the importance of basic tasks, changes in strategic management, engagement in the processes around a strategy, and the importance of strategies for performance. Most Nordic universities have a strategic platform, one composed of aims, ambitions, and key priorities in the realms of teaching, research, and the third mission (Pinheiro and Stensaker 2014; Pinheiro et al. 2016). Yet, the importance of strategies only became a key factor in universities’ activities around the late 1990s. Since then, the importance of university structures has risen alongside the academic aspects of university performance (Amaral et al. 2003). Strategies and structures are related in the sense that aims and priorities result in new forms of resource allocation and the redefinition of internal tasks, roles, and responsibilities. In the Nordic countries, this trend has been reflected in the strengthening of institutional autonomy in legislation, while at the same time, the emphasis of strategies has been on performance management (Gornitzka et al. 2004). Because of these elements, strategies have a central role in defining the performance that is desired in Nordic universities. This chapter focuses on what a strategy is and how is it defined, paying particular attention to the multi-level approach of organisational design (Frost et al. 2016). Thus, we first look at strategy from the point of view of the structure, whereby the meaning of the strategy is a constructive organisational form. The starting point is then the shared commitment to the implementation of the strategy and an element of organisational development. From the perspective of the university structure, strategy is an arena that aggregates diverse interests into common goals. From a structural perspective, university strategy formulation appears to be a rational process, meaning a series of predetermined decisions about how to reach specific ends by resorting to a set of means, what March and Olsen term ‘the logic of consequences’ (March and Olsen 2006). Universities, however, also carry out a wider social agenda, and in the Nordic countries, their funding and mission are closely linked to wider public interest (Pinheiro et al. 2016). Therefore, universities’ strategies are not purely rational practices, but their creation and implementation also involve political choices and limitations (Pfeffer and Salancik 1974). These factors of political choices and limited rational practices do not necessarily optimise performance. Universities have unprofitable activities and/or disciplines that may be unreliable from the point of view of the university’s internal performance. For example, costly educational programmes can be an effective public policy instrument for reasoning, such as analysis based on income, gender, or place of residence, and unprofitable performance can be valuable from the perspectives of regional development strategies and socio-economic regeneration programmes (Habibov and Cheung 2017; Lebeau and Bennion 2014). A second perspective of the strategy is based on processes that either change or maintain the activity. From this point of view, the strategies appear in analytical and logical constructions, whereby the consequences of the strategy are understandable to the intra-organisational practitioners and extra-organisational actors (Whittington 2006). The processes that form the strategy are based on a dialogue that broadly considers stakeholders’ views and aspirations. Strategic processes reinforce the elements of negotiation and compromise but, at the same time, reduce institutional-level solutions (Aarrevaara and Dobson 2013; Pinheiro 2015). If the strategy is largely based on compromise, elements such as transformation may remain weak in the strategy. This is why universities’ ability to undertake reform and organisational change, as well as significant new opportunities for focusing, as a part of their strategy is important. Our third perspective is based on the outputs that the strategy seeks to influence. We interpret the output as an agreement between the internal and external actors of the university, whereby the strategy identifies the organisational goals and the instruments to reach them. From this point of view, university strategies might move universities towards complex and competitive knowledge marketplaces (Pucciarelli and Kaplan 2016). The outputs defined in the university strategies will modify the university’s power relations and produce engagement with organisational values. Further, university strategies are arenas within which to interact with external stakeholders and cope with societal contingencies (Aarrevaara et al. 2017; Fumasoli et al. 2015). Strategies can determine which disciplines or cross-disciplinary research themes are at the heart of the strategy so that they can be focused on strategy-based resources. The key to this strategy is that resources (and resource redistribution) generate change and results in focused areas (Covaleski and Dirsmith 1988). In this chapter, we aim to analyse the data by applying the theoretical and conceptual framework for strategy formulation. This will be done by discussing the literature on strategy as practice and analysing the interviews and survey results as discussed in the first chapter of this volume. Our starting point for analysing strategy formulation is to draw a distinction between strategy engagement and strategy as dialogue. Both questions were asked as part of the semi-structured interviews and the survey. Engagement refers to who the key players in strategy formulation are. Strategy as dialogue, in turn, refers to the process and content of the strategy, as well as the ways in which actors are engaged with, and committed to, strategy formulation. In previous reporting of FINNUT2 project data, attention has been paid to the fact that Finnish professors, as the most senior academic staff, have a wider opportunity to influence strategic processes than they have regarding resource allocations (Pekkola et al. 2017). The early engagement of the strategy is, therefore, much more the work of senior research and teaching staff and those in management and administrative positions than those in other academic posts. In addition, Pekkola et al. (2017) have demonstrated that professors in management positions have experience in preparing for strategy, which is similar to the responses of administrative managers. Above all, senior academics also enjoy relatively more professional autonomy regarding the strategy process (Kivistö et al. 2017). The FINNUT data clearly indicate that participation in strategy formulation is greater at the academic unit level (departments or equivalent) and lowest at the level of the university (see Fig. 7.1). In Sweden, nearly 60% of the respondents reported that they actively participated, whereas in Norway, only about 40% did so, with Finland in between. The data reveal that in practice, and unsurprisingly, engagement in strategy formulation is most common amongst administrative staff and academic managers and lowest amongst academics. 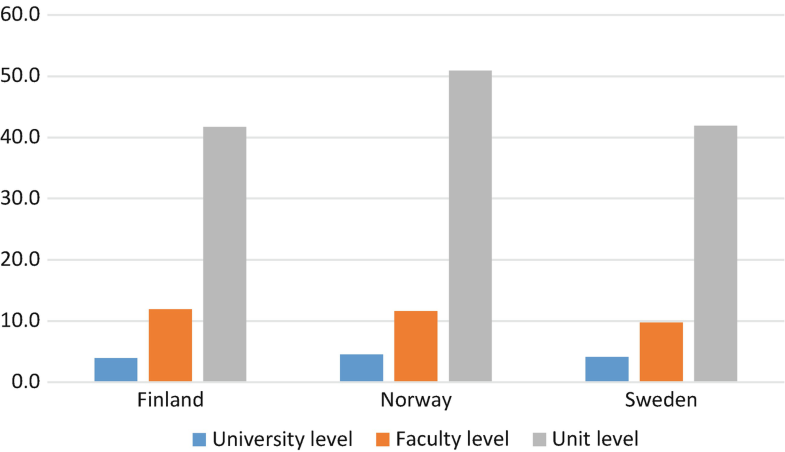 Except for Norway, the countries reported greater levels of participation with unit-level strategy formulation amongst professors when compared with other academic groups (associate professors, assistant professors, senior lecturers, etc.). Also, from the Finnish interviews, we can verify that the engagement of professors who have only academic responsibilities is different from their engagement in strategy formation (see Pekkola et al. 2017). Early engagement is typical for professors with managerial responsibilities, such as deans or the equivalent. However, the roles for research and teaching professors with no managerial responsibilities are different. It is evident that the role of university strategies is understood in a range of ways. Some informants see the strategies as beacons for everyday activities at the unit level, while the rest of the interviewees connected the strategies with institutional views on the universities’ core functions. The preparatory committees for strategy processes are appointed by those who are attached to administrative and academic leadership professions. Membership in these committees is not merely formal but is related to local practices (Johnson et al. 2007). Even if the strategy of early engagement is launched on the basis of the importance of academic units, commitment amongst other staff may be weak. Such a situation arises particularly when academic staff should be the ones empowered to implement a strategy that has already been decided on (Kotter 1996). This creates the need for a specific strategy to be deployed at later stages. However, those who do not have administrative duties in academic positions are not necessarily obligated to commit themselves to the management and management policies. Participation in strategy formulation at the university level and across all three countries is very low (5% for all categories), and at the faculty level, the involvement in strategy also remains low (overall, 12%). This indicates that in the academic units engagement is low, especially regarding university-level strategies. As expected, academic staff engage more in strategy making at the unit level, ranging between 25% and 50%. Professors score the lowest, with only 25% being involved in strategy formulation. Associate professors are the most involved at the university, faculty, and unit levels. What is more, associate professors also indicate that they have the greatest influence on strategy formulation at all levels when compared to their more senior and junior counterparts. That said, overall influence over strategic matters remains quite low at all levels, except for almost half of associate professors at the unit level and about one-third of ‘other’ at the unit level. Professors also scored the lowest at the unit level, with only about one-quarter of respondents reporting that they can influence strategy formulation. Turning now to the qualitative data, some of those interviewed indicated that strategies are primarily formulated to please external stakeholders and enhance the accountability of universities to the government, as the main funding source. In some interviews, the universities were also found to be successful organisations before the introduction of institutional strategies. The following responses from the interviews are concerned with internationalisation and core functions such as teaching and research. However, other informants were doubtful of the relevance of university strategies for the practical work of teachers and researchers. From this perspective, academics as internal stakeholders are not necessarily motivated by the content of university strategies per se, although their motivations may coincide with the strategies. Returning to the survey data, assistant professors are the staff category with the perceived least input on decision-making processes. Academic staff seem to be most responsive to unit strategies: the evaluation of around 60% of assistant professors, associate professors, and professors was that they align their academic behaviour to meet the goals in the unit strategies. Over 30% of the assistant professors, professors, and ‘other’ also responded that they align their academic behaviour to meet faculty strategies, while associate professors scored slightly lower, at 29%. Also slightly lower was the perceived alignment of academic behaviour with university strategies (average 30%). It seems that academics with managerial roles are more responsive to the strategies than the academics in general. The majority of the academic managers (85%) responded that they align their managerial behaviour to meet the goals of unit strategies, 62% to meet the goals of faculty strategies, and 47% to meet the goals of university strategies. On average, 87% of professors with managerial responsibilities reported that they follow strategies. Strategies at different levels (university, faculty, and academic unit) were familiar to the managers at distinct hierarchic levels in the universities. In general, members of the academic staff were not as familiar with these, but some recognised that strategies provide frames for academic work, while others thought these were just formalities that are disconnected or decoupled from daily work. An academic from the latter group remarked that he could have used the strategies more strategically to clarify his research and when applying for research funding. Unsurprisingly, managers and administrators were found to be more dependent on the strategies to guide them in their daily work priorities. The dialogue between managers and academics is seldom based on consensus, as illustrated below. As for the process of decision-making and developing strategies, for the most part, it is described by interviewees as democratic and open. That said, it is still seen as a top-down process. Suggestions for strategies were made at the highest level and developed down the line in the hierarchy. In this regard, the data reveal significant differences between the engagement practices across Nordic universities. For example, at the department level in the Norwegian cases, a broad range of academics were involved, and they reported open discussions amongst staff. In Finland and Sweden, discussion and involvement at the department or equivalent academic unit level was greater than in other areas. Some pointed to the importance of collegial and informal structures. In all three countries, the stakeholders in the local community were also invited to participate in the strategy formulation process. The so-called practice turn in the approach to creating strategy has shifted the focus of debate from an individualist to a more broadly societist perspective, with task dynamics, open information, and influence (Whittington 2006; Pacheco and Newell 2018). This also means a more integrated understanding of the practice of strategy within organisations. The broader meanings of the strategy are embedded in the work of the practitioners so that the perspective can be simultaneously viewed from intra-organisational and extra-organisational perspectives (Whittington 2006). This is of great importance in how practitioners of the strategy produce concepts of strategies. The ‘linguistic turn’ in this approach to strategy brings the opportunity to unleash the strategy and its instruments without needing to follow cultural and historical practices. In this way, the strategy as practice perspective provides the opportunity to build and implement a strategy without organisational memory and, instead, focuses on what the local actors are actually doing (Jarzabkowski and Spee 2009). The linguistic turn has questioned the meaning of the strategy as a form of rational planning by emphasising the importance of strategising the dialogue between practitioners. According to this perspective, the dialogue allows practitioners to contribute to the organisations and stakeholders to a greater extent than their original planning would have done (Harisalo and Aarrevaara 2015). Dialogue is especially necessary when actors can engage in the strategy formulation at an early stage. However, the FINNUT data clearly show that the dialogue is inadequate. In practice, most commonly, it is the senior academic and administrative executives who influence the dialogue at the faculty and university levels, with academic engagement declining as one moves up the organisational ladder. Moreover, based on the interviews, it is clear that the majority of those in academic posts only very rarely have a stake in the strategy formulation process. Thus, in the case of Nordic universities, the dialogue does not seem to work, at least in the early stages of the strategy formulation process, as a convergence of different personnel groups and strategic interests and as predicted in the literature (Whittington 2006; Lebeau and Bennion 2014). Figure 7.2 shows that strategy formulation can be implemented through dialogue at the academic unit level. On the other hand, the numbers of actors at the faculty and university levels are substantially reduced. That said, there are significant variations amongst the three countries. Unit-level influence is highest in Sweden and Finland and lower in Norway. At the faculty level, Finnish and Swedish academics reported greater levels of influence when compared with Norway. Finally, at the level of the university as a whole, Finland and Sweden lead the pack, with Norway lowest overall. In Finland and Sweden only, over two-thirds of the respondents believe that they engage in the strategy process at some level. More typical for Finnish interviewees was the emphasis on funding mechanisms and financial influence in societal interaction and university governance. Most of the interviewees recognised the role of external stakeholders and their influence on university governance. In the case of Norway, strategic work emerges from the interplay between many actors within the university as well as key external stakeholders. Compromise seems to be reflected in the generic nature of the goals being adopted, in line with the traditional democratic model of universities. In open dialogue, informal structures and collegial bodies are thought to play a key role. One Swedish manager suggests that strategies are formulated primarily to please external stakeholders and for enhancing the accountability of universities. This manager downplayed the practical use of strategies for university actors by noting that the university has had considerable success during a period when no strategy existed. Strategy as practice examines the evolution of strategies by studying their formulation, planning, and implementation. Attention is not so much on the consequences of the strategy, such as the economic and organisational effects. Instead, strategy as a practice draws attention to practical work as praxis episodes in formal meetings or informal episodes. From this perspective, practical work is either relevant or does not fit the focus of the strategy. Similarly, individuals can determine their position by combining work practices to understand the various domains of human activity and their interrelation to strategies. In this chapter, and following the interview and survey data from the FINNUT project, strategy as practice focuses on the social dimension and social interactions occurring at different levels of the university. Thus, strategy formation and implementation are not key factors, but staff, management, and stakeholder relations are. However, it has been noted that strategy work is intermittent. The benefits of strategy work provide only temporary revitalisations of the discussions of organisational objectives, which are quickly forgotten once the strategy has been decided upon. The meaning of strategy was unclear for many of the Finnish interviewees, but some emphasised benefits of a strategy. Surprisingly, this was not necessarily dependent on the interviewees’ position or rank. Some interviewees were critical of the whole strategy process. The problem, as raised in the Finnish interviews, is the poor connection between strategies and core functions. Thus, for the Finnish interviewees, the top-down process of strategy management or the discussion at different levels has not been a key problem. The main concern is how the strategy links to university performance, as revealed by the following comments. The accounts from Norway reveal that social relations are aligned with the notion of the university as a more unified, strategic actor rather than a collection of individual units and diverging strategic interests. From a rational-instrumental theoretical perspective (Christensen et al. 2007), strategy documents are considered to be instruments to reach organisational goals, and actors are expected to align their behaviour to match them. Table 7.1 shows the extent to which academic staff and managers state that they align their behaviour with the goals presented in the strategies. It shows that, to a large extent, managers align their behaviour with unit- and faculty-level strategies, but only to some extent with university-level strategies. This confirms the message from the interviews that, for actors in departments or equivalent academic units, the university-level strategies are mostly symbolic rather than core components of their daily working strategy. The survey data reveal that academic departments’ strategies are more strongly based on engagement and dialogue than are university-level strategies. I align my academic behaviour to meet goals in university strategies. I align my academic behaviour to meet goals in faculty strategies. I align my academic behaviour to meet goals in unit strategies. Table 7.1 also shows that academics, in general, align their behaviour to strategy goals to a lesser degree than do managers. Still, more than 80% of academics in the three countries stated that their behaviour was aligned to goals in unit strategies, compared to about one-third in the case of university strategies. When it comes to academics, country differences are less than those seen in relation to managers. However, academics in Finland, Norway, and Sweden have loyalty towards hierarchically lower-level strategies. In Table 7.2, it can be seen that managers reported their behaviours clearly meeting their goals more often than academics at all university levels. I align my management behaviour to meet goals in university strategies. I align my management behaviour to meet goals in faculty strategies. I align my management behaviour to meet goals in unit strategies. Respondents across the sample indicated that strategies have become increasingly prominent since the early 2000s, particularly in the last decade. Competition and the need to coordinate and orchestrate activities across the board, as well as assess performance, come to the fore as key purposes for strategic exercises, which, on the whole, have also become more top-down and central to university life. This section deals with a theme that focuses on strategy at the university level and on the university as a strategic actor. University strategies are essential tools for determining how institution-level goals are enforced in academic units. The alternative is traditional federalist university governance, through which the definition of essential and meaningful work is defined at the level of academic units (Balbachevsky and Schwartzman 2011). The key strategy implementation of this determination is resource allocation. The data presented in this section provide an explanation of how strategy setting and allocation of resources can result in a strong institution at the faculty and academic unit levels. 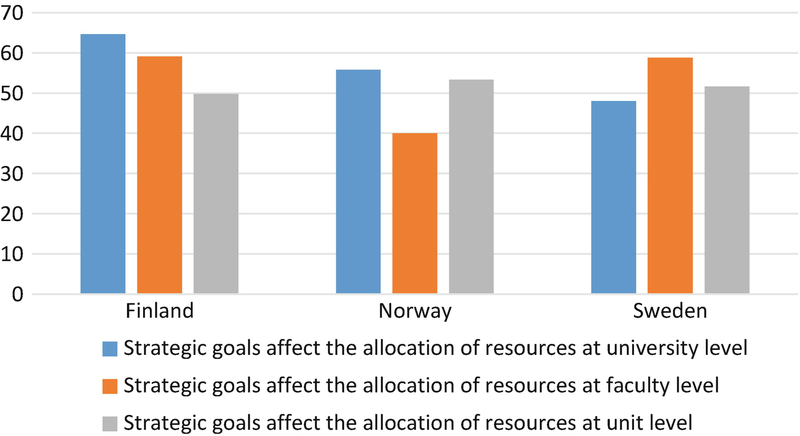 This phenomenon is apparent in the respondents’ perceptions of how strategic goals affect the allocation of resources at the university, faculty, and academic unit levels (Fig. 7.3). The data show slight variations in the ways in which strategic goals affect the allocation of resources. In Finland and Norway, strategies are more geared towards university-level initiatives, such as strategic research areas and the establishment of central level units, such as for research, internationalisation, and other activities. 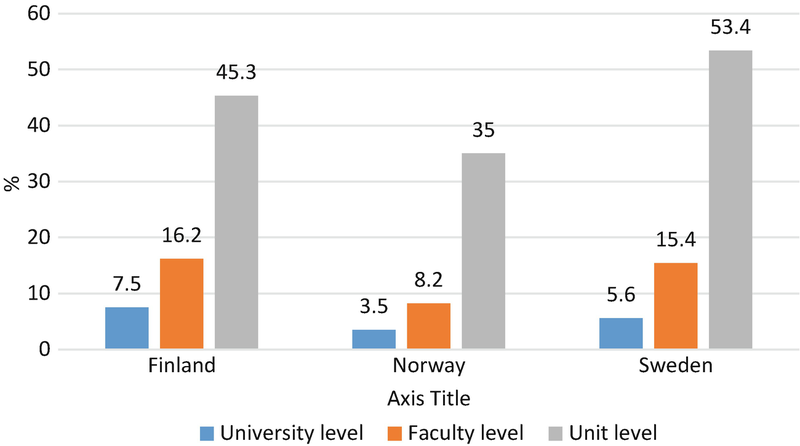 In contrast, the data for Sweden suggest that strategic resource allocations are more prominent at the faculty level. Accounts from the interviews show that managers play a critically important role in implementing strategies and assessing strategic results and that there is an increasing tendency for the coupling of core activities and resources with high-level/strategic goals at the university and faculty levels. The data suggest that in one way or another (i.e. directly or indirectly) university-level strategies have a tendency to dominate over academic unit strategies, suggesting that the relationship between strategies and organisational life has become more top down (hierarchical) than was the case before. In some interviews, there was discussion about how well university-level strategies take into account academic units’ strategic priorities (specialisation areas) and assets (teaching and research excellence). Strategies are thought by some, mostly administrators, to be critical tools in processes of change and transformation (‘modernisation’), as in the case of mergers. There is also evidence of strategic behaviour by faculties in gaining access to strategic resources, but with them acting as though it is business as usual (decoupling). It should also be emphasised that discussions are thought to be beneficial for people who disagree with the final strategy formulations, as it provides opportunities to develop alternative arguments about the overall direction of the organisation. The remit of this chapter was to illuminate two critical aspects underpinning university life in the Nordic countries: who gets involved with strategic processes, and to what extent these processes affect behaviour across the organisation. The results based on the FINNUT survey and our interview data indicate that university-level strategies at Nordic universities lack legitimacy. This is because strategy formulation at these universities is based on the complex relationship between the academic departments and the university. These relationships are governed by the setting of objectives, focusing on research and education, as well as on the role of the strategy in allocating the resources required for implementation. Participation in strategy work was found to be unstable, which in turn further weakens the legitimacy of the strategy. The comparative data show that some academic staff are not involved in the strategy process at all, and hence do not relate their daily tasks to the goals and/or values expressed in the strategy. It seems that in the Nordic countries examined, universities have quite traditional and rational assumptions regarding strategies and strategic work. Academics do not often share this view, as their adherence to the preparation and implementation of the institutional strategies is often accidental. Based on the cross-country data, it can be argued that a strategy has meaning for practitioners and actors in strategy formulation when it is useful to those practitioners. This is particularly apparent in strategy formulation, in which participation is significantly reduced the closer the strategy moves towards the university level. In the three Nordic countries, less than 10% of respondents reported participating in strategy formulation at the university level, and about half of the academic staff reported participating in strategy formulation at the unit level. For administrators, strategy process and strategy implementation are a more natural part of their work. These findings are aligned with the evidence (both within and outside the Nordic region) that recent reform processes aimed at transforming universities into more coherent, strategic actors (Pinheiro and Stensaker 2013; Ramirez 2006) have resulted in a growing gap regarding the values, practices, and priorities of university managers as compared to those of the academic heartland (Berg and Pinheiro 2016; Pekkola et al. 2017). The factors highlighted above make it possible to rebuild universities’ power relationships, engagement, and organisational values in the preparation and implementation of a strategy (cf. Fumasoli et al. 2015). These factors, in turn, define the directions of a university’s future and also legitimise the university’s position as an organisation (Deephouse et al. 2008). When academic staff define a strategy for the benefit of individuals or units, there is no common understanding of what the strategy is in any of the three Nordic countries. For example, in the Finnish responses, it is typical to criticise the priorities or the profile-based development of the strategy. Some of the respondents remain distanced from the strategy and do not follow the goals or meanings of the strategy in their work. It is difficult to define the extent to which the strategies enacted in recent years have affected performance in the realms of teaching and research. That said, the so-called strategic turn seems to be associated (goes hand in hand) with a new culture of performativity and accountability (Hansen et al. 2019). However, it is reasonable to conclude that behaviour changes as internal actors (at different levels) align their activities and strategic aspirations with key thematic (strategic) areas to secure additional resources, both people and funding. In this respect, recent reform processes attest to the importance of resource dependencies (Pfeffer and Salancik 2003) in enacting change and transformation within the Nordic university sectors. That being said, there is also evidence of decoupling (Oliver 1991) once academic communities tap into strategic resources; hence, it is difficult to assess the extent to which strategic priorities are in fact guiding academic behaviour. As regards strategic processes within universities, the FINNUT data sets show that assistant professors and lecturers are the least influential actors in decision-making processes for institutional strategies. Instead, they play a significant role in unit-level strategy work and especially in the grass-roots implementation, or ‘localization’ (Wedlin and Sahlin 2008), of institutional strategies. Therefore, and on the basis of survey results and interviews, the main observation made is that no single group is fully dominant in strategy formulation despite the increasing role played by certain local agents such as university managers. Similarly, there seems to be no common arena in strategy work where the dialogue takes place. Engagement in university strategy is formed in a dialogue where different groups have different roles and participate at different times according to their social standings within the university (Battilana 2006). If and when the dialogue is successful, the different actors’ roles may turn out to be good practices that the university can emulate or institutionalise over time. In those cases in which the dialogue is unsatisfactory and/or it results in inaction or resistance, there is evidence for the belief that academics tend to deny the importance attributed to strategy formulation at the university level. The data also indicate that without a dialogue and engagement role, the content of strategies is not relevant to Nordic universities. The fact is that different types of staff are not involved in the strategy process. In providing similar access for engagement and dialogue, strategy as practice can take place in different contexts for personnel groups and thus produce a strategic process for the university in which internal and external stakeholders become actively engaged. There is a need for scholarly research about the methods and practices through which strategy practitioners can support the engagement of university staff in the process. There is a lack of this knowledge, especially at the university level, where dialogue seems to be weakest. Based on the results outlined in this chapter, academic staff do not accept the university as a strategy-defining actor, and through the interviews and surveys, an interesting question arises as to how performance management practices can support engagement in the strategy formulation process. Interviews were held at six case institutions, two per country: one classic ‘flagship’ university and another with a more ‘regional’ character. FINNUT is a long-term programme for research and innovation in the educational sector under the auspices of the Norwegian Research Council. The programme funds research on a wide spectrum from early childhood education and care to higher education and adult learning. Hansen, H.F., L. Geschwind, J. Kivistö, E. Pekkola, R. Pinheiro, and K. Pulkkinen. 2019. Balancing Accountability and Trust: Higher Education Reforms in the Nordic Countries. Higher Education. Online First. https://doi.org/10.1007/s10734-019-0358-2. Pekkola, Elias, Taru Siekkinen, Jussi Kivistö, and Anu Lyytinen. 2017. Management and Academic Profession: Comparing the Finnish Professors with and Without Management Positions. Studies in Higher Education. https://doi.org/10.1080/03075079.2017.1294578.